Why is my calculation mode set to “Manual”? I want it set to “Automatic”. This is done on purpose by the 14Fathoms software to make the sheets more responsive and prevent a substantial delay if the calculation mode is set to Automatic. When you make changes to your 14Fathoms worksheet the code will recalculate the sheet you are working on. 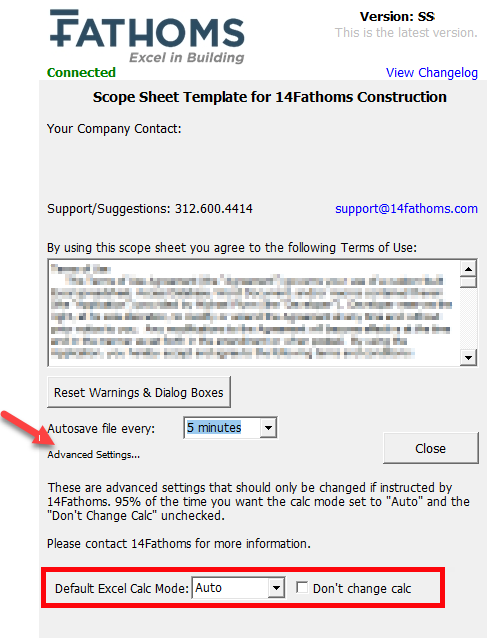 When you exit the 14Fathoms product (either by clicking to a different workbook or closing the 14Fathoms file altogether), or work on a Custom Sheet in a Scope Sheet file, the calculation mode should change to the default mode you have set in the About box. In the box that opens click “Advanced Settings…” at the bottom. Make sure “Auto” is selected in the “Default Excel Calc Mode” and the “Don’t change calc” is NOT checked. Click “Close” to save your setting. You should NOT change the calculation mode in Excel’s Calculation Options while in a 14Fathoms product nor should you have to change the setting in the 14Fathoms “About” box more than once. You should set it and forget it. If you find that Excel is reverting back to Manual mode when you are not in a 14Fathoms product, please contact us. When you copy a range from a 14Fathoms sheet to a different (non 14Fathoms) workbook (it will remain in Manual mode until you go back to the 14Fathoms sheet). If you get an error that causes the 14Fathoms program to close unexpectedly. When you reopen the 14Fathoms product and refresh macros, the settings should be fine. If you have further questions, or your software is exhibiting different behavior than described above, contact us. ← How do I send emails from a Bid List?